The year was 1928. 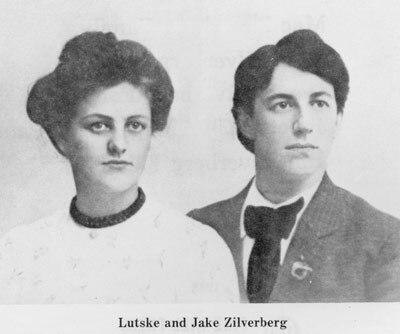 The Dutch immigrants Jake and Lutske Zilverberg moved their family of four sons and one daughter to northern Hyde County, South Dakota. They had lived several different places in southeastern South Dakota before settling permanently 13 miles north of Holabird on the prairie. In those days fences were few and far between. Cattle and horses both roamed at will. Sometimes Lutske would flap her apron to scare away bands of horses who ran through her yard. John Zilverberg, the second son, was a teenager at this time. He and his family worked hard on the ranch. 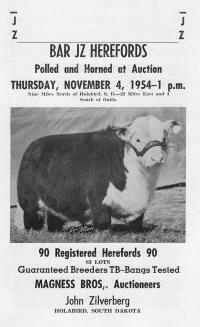 In 1940 John purchased three Hereford heifers. Ranching was put on hold, however, during his stint in the Marines during World War II. 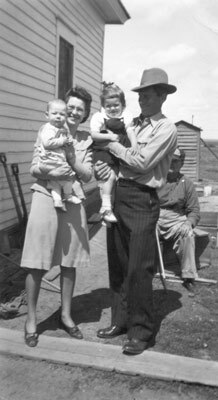 In 1945 after his marriage to Dorothy Boehmer and his discharge, he started ranching in earnest and Bar JZ Ranches began. John held his first Polled Hereford production sale in 1950, first at the Livestcok Sales Pavillion in Miller, SD and beginning in 1953 in his own sale barn on the south ranch. In 1970 we introduced Limousin cattle into the Bar JZ herd. Bar JZ purchased one of the original 100 founding memberships of the North American Limousin Foundation, and today we remain one of only 3 of the original 100 still actively raising Limousin cattle. While we have always emphasized genetic dehorning, DNA testing now allows us to select homozygous polled herd sires and offer homozygous polled bulls to our customers. We also DNA test for genomically enhanced EPDs and Limousin coat color. February 21, 2017 will be the 68th Annual Production Sale of Polled Hereford, Limousin, and Lim-Flex bulls. The third and fourth generations of Zilverbergs (Don, Peg & Seth) continue the Bar JZ tradition of raising Polled Hereford and Limousin cattle. Cody & Kevin both lend their computer expertise from a distance to keep the ranch technology up to date. Lydia and Caroline (5th generation), Cody and Wesley's daughters, are learning to feed the calves with Grandpa Don. Visitors are always welcome to view the cattle, and the coffee pot is always on. John became accustomed to the benefits of genetic dehorning while raising Red Poll cattle with his father, Jake, in the early 1900’s. When he started the Hereford herd, he immediately began breeding toward “100% dehorner” cattle as they were called at the time. When Igenity made available the first homozygous polled test, we began DNA testing for polled genes and petitioned the American Hereford Association to recognize the test on online pedigree pages so that cattlemen searching for homozygous polled cattle could find them. In time this wish became reality; anyone can now search the AHA database for homozygous polled Herefords. We test all sale bulls for the homozygous polled trait and genomically-enhance their EPDs. To the best of our knowledge we offer the most homozygous polled tested Hereford bulls in America. 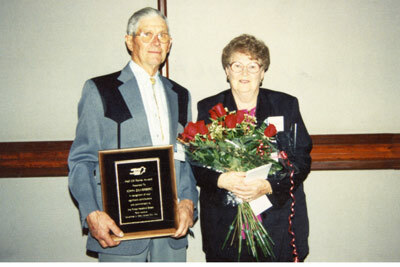 John Zilverberg was inducted into the National Polled Hereford Hall of Fame in 1994.